EPICA is a widely known and regarded Symphonic Metal band from The Netherlands. Formed in 2003, the band had previously released seven full-length albums. 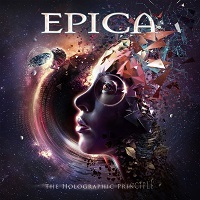 “The Holographic Principle” is the band’s eighth, and contains twelve tracks. “Eidola” is the tone-setting lead-in song. The symphony is tentative and mysterious, especially from the fat whole notes that establish the baseline. Some chanted vocals make it sound like something out of a heretic’s church, and the percussion really shines here. “Edge of the Blade” roars in direct and quickly. Simone’s clean vocals are all over the place…soft and delicate at times, harmonic during other times and far reaching as well. I find myself gravitating towards the vocals over the music in this track. “A Phantasmic Parade” is about the same length, but the harmonized vocal progressions remind me of Eastern influences, and the supporting instrumentation would agree. The bridge section really gathers steam, from the thundering double bass in particular. I love the vocal peaks in the chorus as well. “Universal Death Squad” sound about like what you would expect. It’s ominous and heavy at times, like an army of the undead marching in perfect unison. Other times the melody comes through more, temporarily distracting you from what looms out there. Harsh vocals accentuate the point. “Beyond the Matrix” has some really nice piano work that plays in unison with the clean vocals. Once again I pick up on some Eastern influences with that brief guitar fill before the chorus. Following a sweet bridge is a darker passage with more pronounced heavy guitars and harsh vocals, and a truly outstanding lead guitar solo. As is often the case with the softer songs on EPICA’s albums “Once upon a Nightmare” does not disappoint. It allows Simone’s voice to really soar and the band’s sense of grand melody to take center stage. “Ascension – Dream State Armageddon” combines comely vocals with heard and heavy riffs. The harsh vocals rattle in pretty strong here as well. The Symphonic elements are in the forefront of the song, as good as any seasoned orchestra. “Dancing in a Hurricane” is an interesting song title. The opening part of the song does indeed sound like you are watching a street dancer, clothed in a “bedlah” and hypnotizing you with her moves. About half-way in, the hurricane arrives, with prominent low brass, staccato strings and Death vocals. The closing song is the title track, an eleven minute orchestral piece that expands upon their depth of knowledge of various instruments, and how to connect them into a cohesive piece. The song has a core sound, but man do they find ways for it to stretch out. This is a very difficult accomplishment. It’s the kind of song that really sets this band apart in this genre and puts some distance on their peers. I could literally write a few pages on just this song, and all the nuances, complexities and various techniques that the band uses to tell this tale, but I will spare you the overblown verbosity. Overall, the album is excellent. It is quintessential EPICA in every sense, and might be the best album they have released to date. There aren’t a ton of surprises in the sense that it sounds about what you would expect, but that is a good thing because what this band does well is really unmatched out there.